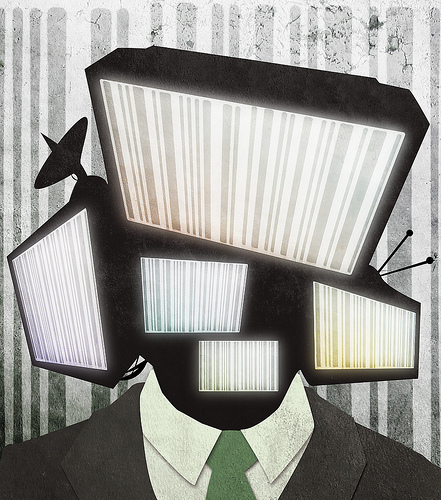 MEDIA ROOTS – The U.S. corporate media avoids contextual analysis of complex issues solely to attract more viewers and obtain greater advertising revenue. By promoting caricature and sensation, the establishment media avoids critical analysis of the political incentives which motivate modern conflict. Translation helps overcome U.S. media’s deficiencies by allowing narratives to cross linguistic boundaries. Dr. Nasr Ad-Din al-‘Aiadi’s chapter in the book Wars: Press Coverage in Arab Media analyzes the relationship between media and war. What is the distance between certainty and delusion? The literature and discussion, which circulated during the War on Iraq, confirms a lack of information about Iraq’s internal circumstances prior to 9 March 2003. The bulk of battlefield operations remained far from the “parasitism” of journalists and covered up what the military produced: victims, prisoners of war, destruction, and ruin. This confirmation implicitly reveals a prevailing silent faith in professional and academic circles, and assumes media present objective, complete information about war. Why this faith? Because there is a preconception that media have presented complete information about wars and previous conflicts. To disperse this delusion, we can ask: What did we witness about the Falkland Island War (the Maldives War), which broke out between the British and Argentinians in 1982? And what did we witness about the Iran-Iraq War, nicknamed “The Bus War,” which lasted eight years? It earned this name because the Iraqi Army was organizing bus trips for journalists to see Iranian prisoners of war. In turn, the Iranian military was transporting journalists in busses to view Iraqi prisoners of war. Everyone knows that journalists were not permitted to move to the battlefield, which would have conveyed the destructive war’s reality and would have shown war’s multi-dimensional tragedies. What did we see of the following wars: the Second Gulf War and the War on Afghanistan, the events of which are still alive in individual and collective memory, in front of insistence by the American Armed Forces and Taliban to prohibit media field work? The Americans and the Taliban pushed the media to capture stereotypical images or clichés in order to signify the presence of war: images of planes taking off from battleships; planes hovering in the sky amid clouds of smoke; anti-aircraft missiles piercing the darkness; a man in Afghan garb smiling and shaving in front of the camera crews; and the corpse of a civilian slipping by the camera’s lens, lying on the sidewalk, without us knowing who was behind his death. Indeed these images, to which one can add the “concentrations” of Afghan refugees along the Afghanistan-Pakistan and Iranian-Afghanistan borders, do not convey the war led by the five wealthiest countries of the world against the poorest countries of the world. Rather, such visuals reproduced stereotypical imagery far from the furnace of war, which convert the scenes into a simplified visual record, and leave one to dig into prejudices without raising any questions. In short, war coverage in Afghanistan was like trying to describe a black cat in a dark room, as the Vice President of Fox News Channel put it. As a matter of accuracy, one can say there are indeed very few examples of media succeeding in highlighting war’s ugly face. Among them: the early days of the launch of the War against Afghanistan and the latter years of the War against Vietnam. Maybe some believe that confirmation of a lack of information about the War on Iraq translates practically into the following judgment. Much has changed recently in the media world. There has been a rise in the number of media outlets, an increase in furious competition among them, and development in their technological arsenals, especially the speed with which they transmit linked, digital information directly to studios and newsrooms. There has been a rise in the pace of this flow, along with the potential to monitor events in a more professional manner. Despite all, humanity still suffers from a scarcity of information and news regarding the war. Indeed, technology cannot eliminate the distance between certainty and delusion. War contributed to overthrowing this illusory visualization, which links advanced technology, the right to complete information, and freedom of expression and the press. Perhaps this fact propelled some researchers to confirm “the demise” of the fourth power. War had been perceived through a set of familiar images: artillery shelling and air bombardment; anti-aircraft armed response; the movement of military units; ambulances racing onto the battlefield, transporting the wounded and injured; explosions; body parts strewn amid the rubble of a car bomb. We can convey war in more depth and greater detail in the photographic image. For example, consider highlighting a woman who is skinnier than her shadow, wrapped in sorrow, in a residential, grey neighborhood in the former Yugoslavia. She lays out her laundry, limited to military uniforms. This image might enrich the view of war. We might likewise tell about the war in Bosnia through the image of a Bosnian grandfather displaced from his town. He left aboard an old Fiat, carrying his humble belongings. An old picture of his father wearing a Tarbush stands out among the man’s belongings. However, in light of a view of war and armed conflicts still under “formation,” we believe the media condense some images, which turned into religious icons through their frequent repetition. These images became evidence to comprehend the conflict on the one hand and to justify it on the other hand. For example, many camera crews were physically standing amid the Israelis to capture images of the sons of the First Palestinian Intifada, but they were largely exempting the Israeli soldiers from their images! Within this shortcut, we find that the Palestinian martyr is translated, in visual media in a solemn procession of large crowds, which raise his coffin wrapped in the Palestinian flag, to his final resting place, amid wails and gunfire, and slogans of various Palestinian organizations. In contrast, a dead Israeli is symbolized by the remainder of a bus, by ambulances and tanks circling Palestinian villages and towns, by Apache helicopters pouring its wrath upon populated district in which “one who is wanted” by Israeli soldiers lives. Indeed, the first images produce grief, sorrow, and perhaps compassion and empathy. The second images don’t include the violent military response only, but justify it. Can one develop a way of dealing with media without varying its content? The U.S. Armed Forces created a new relationship with the press and various media known as “embedding,” whereby the Americans recruit “press representatives and attach them to military units” on the battlefield. For the first time in media’s history, roughly 600 press representatives joined the allies’ forces. Some professional organizations have indeed criticized this practice, expressing their fears that it is a serious violation of the journalist occupation, since the “recruited” press representative commits in writing to respecting 50 articles of a document that defines their “new” life. This whole process revolves around a lack of penetrating “military secrets,” like that of any soldier! Articles 41, 42, and 43 of the same document stipulate the prevention of airing images of military units without approval of the American military authorities! Perhaps the concerned authorities realize verbal communication possesses the flexibility, word play, and metaphors, which allow one to communicate better than imagery alone. If some war correspondents were considering their experiences with Coalition military units as embodying a development in their profession during wartime, then for the following reasons they had a hard time convincing the media masses of this “qualitative step,” which the media made in covering the aforementioned war: Armies don’t usually agree to publish images, except for those which highlight their victories. History is always written by the victors. If they do not, then they need to, maybe even forcefully, go against all who try to write it without their consent. The formula for dealing with reporters has changed its shape. But has its meaning changed in light of the absence of multiple sources and the absence of possibly using non-military news sources? Certain circumstances justify asking that question. Among them, the difficulty reporters face in moving around alone on the battlefield, the lack of space within which to work, and the fact that they’re unable to investigate what is presented to them as “official” information. In war correspondents’ media discipline, freedom to act independently always remains in newsroom officials’ hands, far from battlefield realities. Freedom to act independently takes on new meaning in the dictionary when dealing with the media: abolishing publishing and broadcasting; delaying or cutting off one’s broadcast to lose the real-time feed, and consequently its importance; rewording or summarizing the events, et cetera. What do media do to war? Or what does war do to media? We believe that the sharp debate over the relationship between media and war is still a prisoner of the ancient dilemma and represented in the question: What do media do to war? The Second Justification: The French researcher Armand Mattelard (1992) believes media’s forceful persuasion and its capability to “create” and erase events emerged at a very early time in the history of mass communication, and that war has only reinforced media’s persuasion. These events resulted in giving legitimacy to media censorship. This is the same legitimacy which competent authorities use to justify the measures they adopt in order to limit media activity in any armed conflict. This all started from previous events in which public opinion impacted the course of military operations. Consequently, one understands from the previous two components that war granted armies legitimacy to “control” the media. Armies used this legitimacy to highlight an event, to conceal it, or to draw attention away from it. Consider the U.S. invasion of Panama during a time when events in Romania led to the death of Ceausescu, the Romanian head of state. Despite the fact that the number of casualties from the invasion of Panama was double the number of casualties from events in Romania, nobody talked about the heinous massacres that the U.S. military perpetrated in Panama. The reason is clear. The United States of America had imposed an airtight media blackout of this invasion. In comparison, media exaggerated what happened in Romania in an immoral and unprofessional manner. Media exaggerated events in Romania for the sake of hiding the massacres that the U.S. military committed in Panama. The extent of this control in the media doesn’t stop at “filtering news and information,” but extends to the control media have over war’s image in the audience’s imagination, whether by altering the grounds which the concept of war covers, or by concealing its real goals and presenting them as if they are necessary to attain some humanitarian ideal. This is the framework within which wars and armed conflicts were diagnosed. In other words, wars and armed conflicts were linked to certain people, like political leaders and heads of state. Indeed, this diagnosis explains wars and armed conflicts through factors far from the economy, society, or politics, where war is linked to certain individuals’ behavior and to subjective and personal inclinations. In this context, it approaches chapters of war and armed conflicts as if they were Westerns, in which a good cowboy fights an evil cowboy. Or media give a simple, naive explanation for wars, like saying that World War II broke out due to Adolf Hitler’s coarse disposition and mood swings! Military experts, who comment on events and entice studio correspondents, also enter involuntarily within the aforementioned endeavor. Television channels now have an honorable and defiant desire to use all possible means to transmit the facts of war and explain the military strategy used. Due to repeated scenes and an absence of images and information about war’s on-goings, this presence slid into what resembles an athletic sports match: players are on the field, while coaches and specialists comment on the contest from the studio. And so, on a symbolic plane, war transformed into a spectacle absorbing humane and permanent elements in order to open the field to dramatic content and commentary of the conflict. The aforementioned concepts and methods used were incapable of changing the image of war, armed conflicts, and its goals pertaining to collective consciousness. We believe that now is the time to approach the relationship between war and the media from other angles. Among them: What do wars do to media? This dilemma, if filled with scrutiny and precision, can withdraw the aforementioned debate from a domain of justification and place it on the platform of critical review in order to analyze what media does during wars and armed conflicts. This will occur in order to upgrade the media profession, despite difficult circumstances which might ultimately take the journalists’ very lives. This will also occur for a new debate to explode around media’s relationship to reality, around media’s moral and literary responsibility, and about standards to evaluate media’s credibility. Who said media is satisfied with simply transmitting news during war? The lack of information about the War on Iraq is reflected in a belief, which is considered genuine to some and naive to others. This belief indicates that media’s job remains the same regardless of the context within which it is active. In other words, the functions that direct media’s activities stay the same whether in circumstances of war or in a peaceful context. Indeed, trying to escape from the burden of this belief should not be understood as a blessing to what media does, but should be understood as describing earlier experiences. Has it not been said in the past that propaganda is the legitimate daughter of wars? Historians confirm World War I created propaganda, and specified propaganda’s initial definition as follows: the overall activities and work that a government undertakes to influence the citizenry and public opinion. This concept had developed in World War II to become synonymous with psychological warfare, which includes disinformation, rumors, spreading false reports, and misinformation. Wars have changed media’s roles, since wars pushed media to incline towards propaganda more than information. Can it be said that media, which belong to states involved in war or are a party to these states, had strove to stand up against this inclination and succeeded? The examples that proved this success were regrettably very few. The famous satirical French newspaper Le Canard Enchaine came into being for rejecting war propaganda and government censorship of the press. Wars had supplied the public with a fundamental lesson: many media outlets toe the line between information and propaganda, a line which could be destroyed if the horrors of war intensified. Then, one should ponder the most useful and most feasible ways to take a stand against media’s transformation into an obedient instrument of psychological warfare during armed conflicts, as evidenced by its submissiveness to the justifications, which we touched upon in asking “what do media do to war?” We believe diversifying news sources and preferring neutral ones is the first way to take a stand. And if neutral sources cannot be reached, then the source from which news is derived must be confirmed. This assurance addresses the audience clearly and implicitly, and directs their attention to the necessity of dealing with this news cautiously or to put its content in parenthesis. Note: For all original citations and formatting, please consult the original text.